I’ve been kind of busy lately and haven’t been playing quite as frequently over the past couple of months, but it’s the beginning of the WSOP again and while I don’t have a two-week trip of shame planned this year, I will be in Las Vegas on Wednesday this week, for a quick overnight trip to play (hopefully) an event at the Venetian (as opposed to an event at the Venetian and then three or four other bust-outs before I head home Thursday night). I’ve played 90 tournaments this year with four or more tables, and my ITM in those games is 18%. 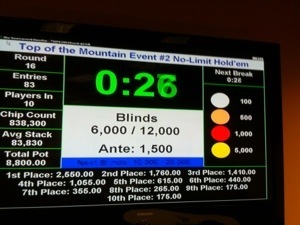 I hadn’t had a big win for a while, but back in mid-March, I cashed well in the Aces Players Club $25K, then I was in a multi-way chop for the one of the Spirit Mountain Top of the Mountain Events in May. Despite the fact that they were exactly two months apart, I only played two other $100+ buy-in events between them because of schedule issues (like I said, I’ve been busy). The field sizes were 92 at Aces and 83 at Spirit Mountain; I feel like making the final table for two of four in that period wasn’t bad (although I’ve played three since Spirit Mountain without a cash). Vegas is already over 100 degrees, it’s not supposed to get below 80 Wednesday night. I’ll be staying at The Quad for the first time since the renovation as will my poker guru. I’m flying in at 9am and I’ll hustle over to The Venetian, most likely to play in a Limit Omaha Hi tournament. Opinions on that from fellow players here in Portland are decidedly mixed, with a few people shuddering at the thought of limits and no lows and others expressing some interest to hear how it goes. I went on the Pokerstars mobile app this evening and ran 500 play betting units up to over 2,500 in short order by continually getting the nuts. I think that will be my strategy for the tournament. That’s a two-day tournament, so hopefully it will be the only one I’m playing on this trip. There should be around 120 players, if the other similarly-priced Limit Omaha8 and Stud8 events can be counted on as a guide. Depending on if and when I bust out of that game, I’ve got a list of other games at venues around town to choose from, though the big ones are the WSOP Deepstack $235 at 3pm (today’s game had 1,235 players with $45,800 up top; according to a shot of the tournament clock, by level 7 the average stack is 30BB with 60% of the field left). The Venetian has a Survivor tournament at 4pm with a great ROI if you make the money because the entire top 10% of the field chops for a profit of more than 700%. After 6 are choices of the smaller WSOP Deepstacks at 6pm and 10pm and the last Venetian game at 7pm. If I’m not playing the second day of the Venetian tournament on Thursday, most likely my only option will be the $70 daily event at Caesars at 9am. I don’t think anything else can be counted to be over in time to get to my 10pm flight. Gonna touch the live wire again and see if I have a better experience than last time. See you inside where it’s air conditioned. The following is a message based on payout structures from the Venetian Deepstack Extravaganza series (this PDF is no longer on the Venetian web site, the link goes to the invaluable archive.org). Everyone likes to maximize their money, and the conventional wisdom says: “More entries, more money.” But as we know from brutal experience, we don’t always win the top prize. How do you make the most of your tournament dollar? Plan for the average. Obviously, if you don’t make the money at all, you’re a loser. But if you do make the cash, what can you expect to make, on the average? Field size has a lot to do with that. While the money up top is always great, looking at payout structures like the Venetian’s makes clear that there’s a “sweet spot” in tournament size for anyone who cashes on a regular basis. 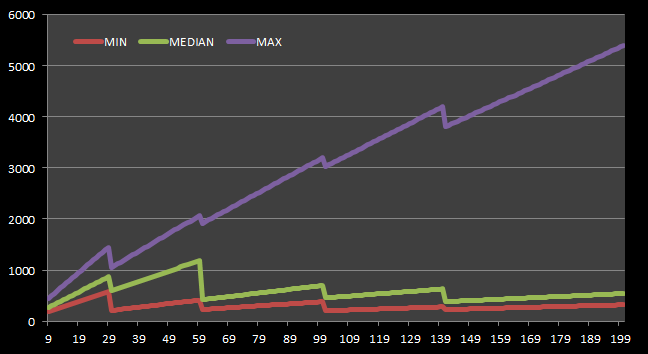 This chart shows the minimum, median, and maximum payout from a single full table to 200 players based on every $100 per player in the prize pool. What’s being represented here? Specifically, it’s the bounds of the smallest possible cash (someone who beats 90% of the field) in red, the person who beats 100% of the field (minus themselves, of course) in purple, and the person who makes it halfway through the cash by beating 95% of the field (in green). There is, of course, variation in payout structures, but there is always a point at which the maximum prize begins to exponentially outstrip the median. In the case of the Venetian Deepstack structure, that shift happens at 60 players, when the median value goes from nearly 60% of the maximum payout to a mere quarter of the max. In the zone between 30 and 59 entries, the median payout is almost three times the minimum cash, in the next zone, it’s only double. In the last zone represented in these charts, the median cash is just 10% of the maximum, and only 160% of the min-cash. Playing tournaments with 4 to 7 tables then becomes a quantity game, with maximum prizes from just under 900-1900% profit and median cashes of around 500-1000% profit. For players with and ITM of 20%, those size games should be good targets.